If your Family is like ours, and loves Disney Pixar’s The Toy Story, you are going to love this news. 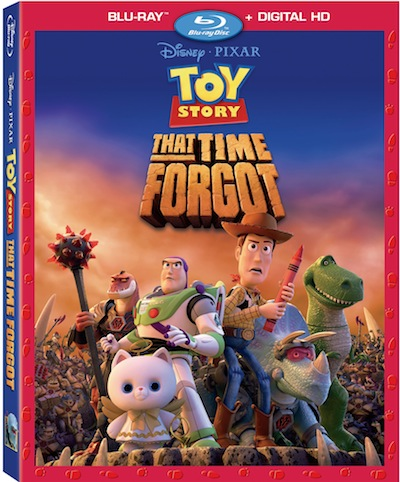 Disney•Pixar proudly presents a hilarious new animated adventure,TOY STORY THAT TIME FORGOT, Join Woody (Tom Hanks), Buzz (Tim Allen) and the gang for an unforgettable tale packed with family fun and a must-have for every Pixar fan’s collection! During one of Bonnie’s post-Christmas play dates, the “Toy Story” crew find themselves in uncharted territory when the coolest set of action figures ever turn out to be dangerously delusional. It’s all up to Trixie, the triceratops, if the gang hopes to ever return to Bonnie’s room. Available for the First Time on Blu-ray™, Digital HD and Disney Movies Anywhere on November 3rd. Sing-Alongs and Over 10 Minutes of Deleted Scenes! Synopsis: Disney•Pixar proudly presents a hilarious new animated “Toy Story” adventure. During one of Bonnie’s post-Christmas play dates, the “Toy Story” crew find themselves in uncharted territory when the coolest set of action figures ever turn out to be dangerously delusional. It’s all up to Trixie, the triceratops, if the gang hopes to ever return to Bonnie’s room. “Toy Story That Time Forgot” is an unforgettable tale packed with family fun and a must-have for every Pixar fan’s collection!